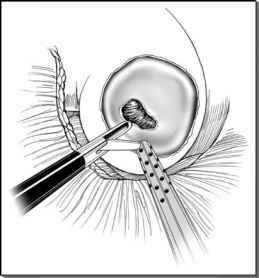 Development of laparoscopic radical prostatectomy started with the experience with transperitoneal laparoscopic access to the prostate and seminal vesicles employed by a few surgeons (2,5,15). In fact, transperitoneal laparoscopic radical prostatectomy was successfully introduced in routine clinical practice in France following the pioneering work of Gaston and Piechaud in 1998 (unpublished series). This approach became predominant worldwide and is currently considered the gold standard of laparoscopic prostatectomy. However, other teams have shown that primary transperitoneal incision of the Douglas pouch is not essential for the dissection of seminal vesicles. Rassweiler et al. (4) proposed a technical alternative by approaching the Retzius space directly through a transperitoneal access and reproducing the retrograde technique described by Walsh. Raboy et al. performed the seminal dissection after transection of the bladder neck using a purely preperitoneal approach (9). Creation of a preperitoneal working space was initially described to perform laparoscopic inguinal hernia repair (16). Later, access to the preperitoneal space has been used for many other laparoscopic procedures including pelvic lymph node dissection, bladder neck suspension, varicocelectomy, and more recently, radical prostatectomy (9,16). We developed a technique with initial blunt finger dissection, which is a fast, safe, and a less costly alternative to the balloon technique (16). Performing this dissection anterior to the posterior rectus sheath minimize the risk of inadvertent entry into the peritoneal cavity. Trocar geometry is similar to that previously described in transperitoneal laparoscopic radical prostatectomy but a sixth trocar can be introduced during initial space creation. Prostate dissection is performed in a traditional anterograde fashion and allows preservation of the neurovascular bundles. All crucial elements of our previously described transperitoneal technique of laparoscopic radical prostatectomy (17) are reproduced and only a few technical points have been modified since we switched to the extraperitoneal approach. Trocar geometry is similar to that previously described in transperitoneal laparoscopic radical prostatectomy but a sixth trocar can be introduced during initial space creation. This 5-mm suprapubic trocar does not result in any additional morbidity but we have found it useful when mobilizing the prostate (Fig. 4). Prostate dissection is performed in a traditional anterograde fashion and allows preservation of the neurovascular bundles. During this step, we prefer to use clips rather than any kind of thermal energy to achieve hemostasis. Based on our favorable experience with vesicourethral reconstruction performed using two hemicircumferential running sutures (18), we recently adopted the technical modification proposed by Van Velthoven et al. (14). Such latter technique requires only one intracorporeal knot instead of three, and simplifies the control of the posterior half of the anastomosis since all the posterior stitches are placed prior to approximating the bladder neck to the urethra. ■ Reduces risk of intraperitoneal injuries during laparoscopic access. ■ Laparoscopic preperitoneal access renders bowel adherences due to previous abdominal surgery a technical nonissues. ■ Previous inguinal herniorrhaphy with mesh increase the complexity of prevesical space development. Pelvic lymphadenectomy is often impossible in these cases. Attempts to decrease operative time and perioperative morbidity should not outrival the oncologic principles. In a comparison between extraperitoneal and transperitoneal laparoscopic radical prostatectomy at our center, measures of perioperative morbidity (postoperative pain, time to full diet) were more favorable when using the extraperitoneal technique (13). During transperitoneal laparoscopic radical prostatectomy, some urine and blood inevitably enter the peritoneal cavity, potentially causing at least some degree of chemical peritonitis. Persistent urine in the suction drain can be present for more than six days due to anastomotic leakage in 10% to 17.2% of patients (19-21). In transperitoneal laparoscopic series, prolonged ileus attributed to anastomotic leak was reported in 2.8% to 8.6% of cases (6,21). In another large series of transperitoneal laparoscopic radical prostatectomy, secondary anastomotic leakage in combination with acute pain, acute urinary retention, and peritoneal irritation syndrome occurred after catheter removal in 2% of patients (19). Ileus, anastomotic leak, and hemoperitoneum are all classified as group II by Clavien for laparoscopic surgery (19,22). Grade II complications are defined as "potentially life threatening but without residual disability." Establishing the complexity and technical difficulty of a surgical intervention is mostly a subjective exercise. However, indirect data suggest that, in certain institutions, the extraperitoneal approach may provide a simplification of laparoscopic prostatectomy. Currently, only a few studies comparing transperitoneal versus extraperitoneal laparoscopic radical prostatectomy are available in the literature (13,23). The initial results of extraperitoneal laparoscopic radical prostatectomy in terms of oncologic cure and preservation of continence and potency are similar to those of transperitoneal laparoscopic radical prostatectomy (10,13,24). Extraperitoneal laparo-scopic radical prostatectomy seems to be reproducible, with possibly a shorter operative time by 10 to 54 minutes (13,23,25). These advantages gain importance in an academic center like ours, especially because teaching laparoscopic radical prostatectomy is a complex process requiring a large number of cases (>50) to reach the plateau of learning curve (26). Nevertheless, attempts to decrease operative time and perioperative morbidity should not outrival the oncologic principles. To objectively determine the relative benefits of the transperitoneal and extraperitoneal approaches, a prospective comparison is awaited. Laparoscopic radical prostatectomy is undergoing a continuous technical development. We consider the extraperitoneal approach the logical evolution of laparoscopic radical prostatectomy because it combines the advantages of laparoscopic surgery and retropubic access and reduces operative time. We also believe that the extraperitoneal technique may shorten the learning curve of laparoscopic radical prostatectomy. Although well standardized, further evaluation of long-term results of this technique is necessary.